Heat oven to 425°F. Arrange carrots, onion and squash on two rimmed baking sheets. Drizzle with 2 tablespoons oil and season with salt and pepper. Roast, turning once, until tender and caramelized, about 30 minutes. Place lentils and shallot in a medium saucepan and cover with 2 inches of water. Bring to a boil then simmer, covered, until lentils are tender, about 20 minutes. Drain an discard shallot; Season with salt and pepper. Combine vinegar and mustard in a small bowl and drizzle in 3 tablespoons oil in a slow steady stream, whisking constantly. 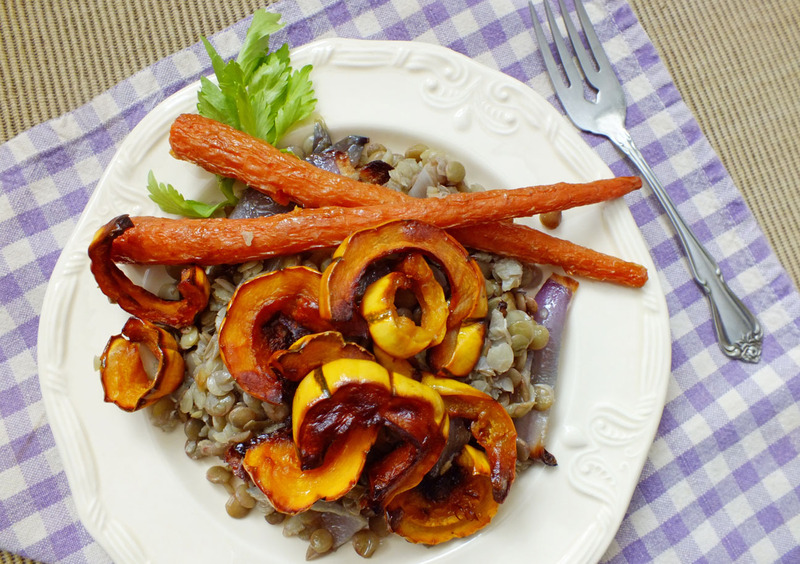 Toss lentils and celery with vinaigrette; season with salt & pepper. Spoon over roasted veggies and serve garnished with celery leaves.